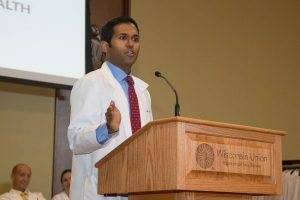 This past June, the UW Physician Assistant Program held its annual White Coat Ceremony, a tradition that commemorates the beginning of students’ clinical year. Dr. Meduri closed his talk with the same advice that he not only gives the PA students at the end of his lecture series, but that he also received during his first few weeks at UW: “Be humble, be hungry, and be the hardest worker in the room.” The source? Dwayne “The Rock” Johnson. Words to live by. Thanks, Dr. Meduri!